Camping at the Black Rock Rendezvous. Be Prepared! Drive with caution. There will still be wet areas on the open playa. Use good judgement, follow fresh tracks. Food/water: One gallon of water per person per day. Most meals will be on your own. Shelter: Tent camping from your car is easy to do. Some people just sleep in their truck. 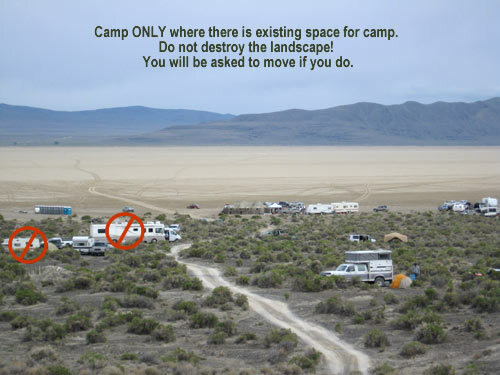 Travel trailers and RVs will find it easy to find a spot along the edge of the playa. It can get windy, bring suitable stakes and gear. Appropriate clothing: Temperatures can vary from hot during the day (90° F) to colder at night (40° F). Wear layers and have an extra jacket or sweatshirt. Be sure to bring sunscreen and a wide brimmed secure hat. Some tours and activities will involve hiking, so bring good shoes. Gloves will be available for project volunteers, but you may bring your favorites. Rain gear always advisable. High-clearance vehicle: High clearance is required for some tours and a good idea for other tours. Be sure to have a full sized spare tire when possible, and also a working jack and lug wrench. Carpooling recommended on all tours. Chairs, plates, utensils, mugs. Don't forget to bring these essentials for group dining and speaker events. Radios: CB and FRS radios are great for staying in touch with other participants, and tour leaders may use them to give extra information while driving. Licensed amateur (ham) radio operators will find that we have great coverage, courtesy of Friends new repeater. Click here for frequency details. Bring your own plates/utensils to all potlucks. Camp is located over a dispersed area, with the Main Camp being along the edge of the playa about 3.2 miles north/northeast of the 12-mile desert entrance. Porta-potties will be provided at the main camp. Please do not put trash into the ports-potties! Camp on durable surfaces. To reduce erosion and damage, the dunes and hummock areas around the playa edge are closed to vehicle use, i.e. drive in camping. Walk in camping is permitted. There are several suitable camping areas along the 2 track route between the playa and Cassidy Mine camp site (Photo to Right). Cassidy Mine road is not maintained. High clearance vehicles only. Not suitable for towing trailers up from the playa.If you are towing a vehicle and want to experience the panoramic views from Cassidy Mine (Photo Below) camp at the top of Cassidy Mine Rd., accessed via Soldier Meadows Road. It is recommended that you check in with the camp host before setting up camp so that we may advise on the camping location that matches your camping comfort. If you're looking for a rave camp experience, this is not it---we invite you to camp at least one mile out from Center Camp, as music floats everywhere in the stillness of the night. "Leave No Trace" means pack it in, pack it out. There are no garbage cans at this event. Please be prepared to take all of your own trash and recycling with you. Of others need assistance in loading out, or you see trash on the ground, please be a good neighbor and help. RAIN: Rain will cause the playa to be impassible. Please watch our Facebook Page for weather updates, and stop by our office at 320 Main St. Gerlach, for up-to-date info. If rain should occur it will be necessary to leave the playa immediately, either by taking the road from the Main Camp to Cassidy Mine, or by going back to the 12-mile desert entrance. We will congregate at the Community Center in Gerlach.